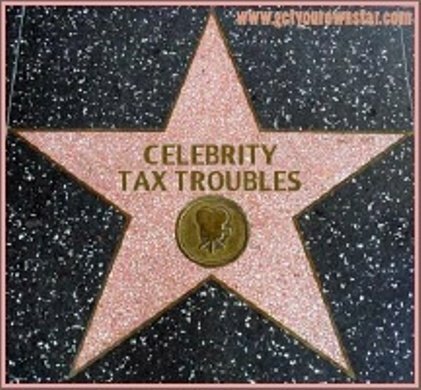 If you’ve read my stuff enough, you know how I feel about celebrities owing the government obscene amounts of money in back taxes. Clearly, there are some celebrities who believe they’re above the law, while there are others who probably just trusted the wrong financial advisor. Whatever the case, they still owe the money like the rest of us. It’s not like they don’t have the funds to cover their payments. That being said, below is a list of the top ten musicians (in alphabetical order) who have had an issue or two with paying their taxes…..
As a disc jockey in the early Fifties…accepted a lot of payola, cash from record companies in exchange for airtime…failing to claim the cash as income and pay taxes on it got him indicted in 1964. He’s been to prison three times…[including] the four months he served for income tax evasion in 1979. Jeffrey Atkins (a.k.a. rapper Ja Rule)…[currently] faces incarceration for failing to pay taxes on $3 million in income. …was slapped with a $2.5 million bill [in 2007] for failing to pay Uncle Sam for five years. He pled ignorant; his brother, who acted as his general manager, and his accountant took the fall. In December 2009, a tax lien totaling $1.6 million was placed on a piece of his real estate in Long Island. In 2010, the same piece of property received another lien for $1.8 million. [Owing] $33,000…was enough to send the police to the home of Clifford Smith, Wu-Tang Clan rapper Method Man, to repossess his truck in 2009. Method didn’t fight. He turned himself in, admitting that he’d been receiving letters from the IRS since 2002, and [that he] couldn’t pay because he was high — for seven years. [According to] the Chaska Herald in Minnesota…Prince R. Nelson, owed $450,000 in back taxes on his real estate, including $227,000 owed on his Paisley Park studios. [When the Rolling Stones created a will] they set up private foundations in Holland, where laws about public access to information revealed that of the £242 million the Stones had made in royalties since 1986, they’d paid only £3.9 million in taxes…that’s only 1.6 percent. And yet, thanks to legal loopholes and legit shelters, it’s 100 percent legal. …In 1998 she filed for bankruptcy due to a $3.9 million debt. Now she purportedly owes between $10 and $50 million, including a $900,000 defaulted loan to City National Bank and mortgage payments to Bank of America…[and] $400,000 to the United States government. [Whitney]almost lose her New Jersey estate in 2006 due to back taxes and delinquent mortgage payments totaling more than $1 million. A couple of months later she auctioned off more than 400 personal items — from pianos to lingerie — to raise funds. [Although he claimed it was Price Waterhouse’s fault] Willie Nelson was the one who had to pay when the IRS seized his assets abruptly in 1990 and charged him $16.7 million for hiding income in tax shelters ($10.2 million of it was interest and penalties alone). To pay it off, he released a double album and auctioned assets (mostly to friends who later returned them). 50 queries in 3.304 seconds.